President Trump A.K.A. ガチャン！”Gachan!” is the onomatopoeia for “a slamming noise such as hanging up the phone on someone.” ガチャン became my personal name reference and joke for Trump in Japan after the news on Feb 2, 2017 of President Trump hanging up the phone on Australian Prime Minister Malcolm Turnbull. It was all over Japanese news channels. As a matter of fact, Trump was all over Japanese new channels and shows every day, repeatedly. I found this particular day quite amusing. Not the serious subject matter which lead to Trump’s actions, but the way in which Japanese media portrayed this story. ガチャン was displayed on the TV screen with animation like reading manga (Japanese comic book) or watching anime with sound effects appearing on the screen. It was quite amusing! I choose to write this post simply to share the sentiments of the Japanese people about President Trump that I encountered. I think this is worthy of a blog post because EVERY person including CHILDREN that I encountered commented about President Trump within 5-10 minutes of our encounter. They expressed their disappointment, dismay, and concern about the future for the whole world. They asked me about my opinion and who I voted for. 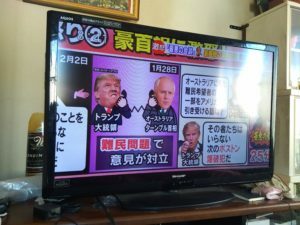 Trump has a very negative image in Japan–do a Yahoo Japan search for “President Trump” to see the dominant images. One of my Japanese friends, Takuro, asked me to practice English with him. I would quiz him on Japanese onomatopoeia words in English. I would say the Japanese sound or word and he would guess the English. I said, “what is ガチャン！” He replied emphatically, “Trump!” Now, explain that! That became our personal, memorable and private joke! ← What do you think about the interactive map blog?